Insurance Claim Attorney Houston → Do I Need a Lawyer If My Insurance Claim Was Denied? Do I need a lawyer if my insurance claim was denied? You’ve been injured in a car accident that wasn’t your fault. Dealing with the after-effects of a car accident can be stressful, time-consuming and an exercise in frustration. After an accident, you may have encountered serious injuries, medical bills piling up, and the loss of your vehicle. Not to mention dealing with the pain and problems caused by the collision. Often times the situation is made even worse by the insurance company’s refusal to treat you fairly. Instead, the insurance company denies your claim or says they are only accepting partial responsibility for the collision. While the police report blaming the other driver for the collision is persuasive, it does not mean that the insurance company is going to accept responsibility for the accident or the harm you sustained as a result of the collision. We regularly handle claims where the insurance company and its insured refuse to accept responsibility for the claim. This has happened in cases where a person gets hit head-on, rear-ended or where the other driver disregarded a traffic control device. If the insurance company is giving you the runaround, you may need to consult with a car accident lawyer to discuss your options. Dispute over the Accident: Typically, the insurance company will argue that its policyholder did not cause the car accident. This is usually based on the biased statement of its insured or a strained interpretation of the police report. Sometimes the insurance company will try to use your own statements against you in denying the claim, which is why we recommend not giving a recorded statement to the at-fault insurance company. In the context of litigation, the insurance company may hire an expert to argue that you took faulty evasive action or did something else to make you primarily responsible for the collision. Lapse of Policy: If the policyholder gets involved in a car accident after the policy was canceled or expired, the insurance company will not pay the claim. In this circumstance, you must determine whether other insurance was in effect at the time of the collision. If not, hopefully, you have comprehensive coverage so that you can ask your own insurance company to help cover the damages you sustained. Not Listed on the Policy: Texas law allows an insurance company to specifically exclude certain individuals from a policy and it allows insurance companies to sell what are known as named driver policies, which only cover the individuals listed on the policy. If the at-fault driver was excluded from the policy or not listed as a named driver on a named driver policy, then the insurance company will deny the claim. Again, in these situations, hopefully, you have comprehensive coverage for both your vehicle or property damage and the bodily injury portion of your claim. Pre-existing Conditions, Minimizing Your Injury & Medical Records: Just because an insurance company says that it is going to accept responsibility for your car accident that doesn’t mean the company is going to treat you fairly. In fact, the value of your claim is usually what causes the greatest amount of disagreement. By way of example, everyone’s body degenerates as we age. Insurance companies and defense lawyers love to argue that this natural process is what caused your injuries. Meaning it is merely coincidental that your body started to hurt after the car accident. In fact, insurance companies have a plethora of paid medical “experts” who will testify that your problems are not related to the collision. The same is true if you had a back problem 10 years before the collision that completely resolved and now you have a back problem, the insurance company will argue that your problems are related to the old injury. 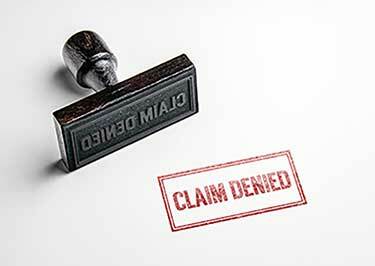 What to do if your claim has been denied? What you should do depends on the nature of your injuries. If you weren’t injured and you just need help with your property damage claim, you will have a tough time finding a lawyer to help you. As a result, the first option we recommend is just simply filing a claim with your own insurance company. They will pay to fix your car and then deal with the other insurance company. File a claim in small claims court to hold the person accountable. Help gather evidence: Your car accident attorney should help you gather evidence to help demonstrate why the other side is at fault and what your damages are as a result of the collision. Depending on the case, your lawyer may need to hire experts to help the jury understand what occurred or how your injuries will affect you in the future. Help make sure you are getting the care you need. Often times a person is injured and he doesn’t have medical insurance or the doctors refuse to treat a person involved in an accident. Your lawyer can help you locate highly qualified medical professionals to help treat your injuries. Explain the law and review paperwork: If your adjuster has said something to the effect of “this is all the law will allow”, you know you are dealing with a dishonest adjuster. Except in limited circumstances, the law doesn’t set caps on damages. The jury gets to decide what is fair. A qualified car accident lawyer will help you understand your rights and the claims that can be made as a result of the collision. Your lawyer should help you review all relevant paperwork from the insurance company to make sure you understand what is going on throughout the process. This is especially important if you are being asked to sign a release or some other waiver of your rights. Negotiate: By hiring a lawyer, you will have someone on your side to negotiate with the insurance company. A skilled attorney will know the law and will advocate for the highest possible settlement. If you can’t reach a fair deal with the Insurance Company: A lawyer can help you file suit against the at-fault party for the harms and losses you sustained as a result of a collision. Generally speaking, in Texas, you have two years from the date of your accident to file suit. A good attorney should be there for you every step of the way to ensure that you are treated fairly throughout the process. If you were denied an insurance claim and are unsure of the next steps to take, you should speak to an auto insurance claim attorney who can provide proper legal guidance. Call (713) 987-7111 or send us an email to discuss your insurance claims case.